This post is co-written by Dr. Jill Robbie (Glasgow University) and Anna Berlee (MEPLI fellow). It is a cross-post from the University of Glasgow School of Law Blog. The previous post by Dr. Akkermans already mentioned the Land Reform in Scotland as an example of creative private law solutions. Today we would like to delve in a bit more with a specific eye to the reforms proposed in land registration in Scotland looked at also in a broader light with perspectives from the EU with its recent 4th Money Laundering Directive and individual Member States like Germany with its limited access to land information. Property law in Scotland is now headline news. The Scottish Parliament has recently overhauled the land registration system through the Land Registration etc (Scotland) Act 2012 which came into force on 8 December 2014 and fundamental changes are being proposed in the Land Reform (Scotland) Bill which was introduced on 22 June 2015. The changes have caught the attention of many including think-tanks, campaigners, academics and the media. A central issue in these reforms is publicity, in particular the amount of information that should be registered in the Land Register, and by whom it may be accessed. Publicity in general is an important principle of Scottish property law. Scotland was precocious amongst European legal systems in introducing a public register of title deeds in the form of the Register of Sasines in 1617 but since then, so it is said, it has rested on its laurels. Only 21% of the land mass in Scotland is registered in the now digital, accessible, plan-based Land Register which was introduced in 1979. As using the Registers of Sasines requires the specialised skill and expertise of a conveyancer, and some land has never even made it onto this register as it has not been transferred since 1617, it can often be difficult to discover who owns Scotland. This can be problematic if someone wants to offer to buy a piece of land or even discuss the use of the land with the owner. To combat these problems, in May 2014, the Scottish Ministers announced a commitment to complete the Land Register in 10 years. The Land Registration etc (Scotland) Act 2012 contains provisions that can speed up the pace of Land Register coverage including those on Keeper Induced Registration. A conference was held on 10 March 2015 where the Deputy First Minister John Swinney announced that a taskforce led by the Keeper of the Registers of Scotland would report to him by the end of July about creating a single digital land and property information database. This database would aim to collate together the important information regarding land from all the scattered places where it can currently exist. It was argued that inspiration could be drawn for this purpose from Norway where Ambita, a company owned by the Norwegian Ministry of Trade, Industry and Fisheries, administers a portal to comprehensive digital information regarding all land in Norway. A further proposal aimed to increase transparency was contained in the Land Reform Review Group’s Final Report of 23 May 2015 where it was suggested it should be incompetent for a legal body to register title in the Land Register if it was not registered in a member state of the EU. The justification for this proposal was to increase the traceability and accountability of overseas legal bodies, which is connected to combatting tax fraud and evasion. 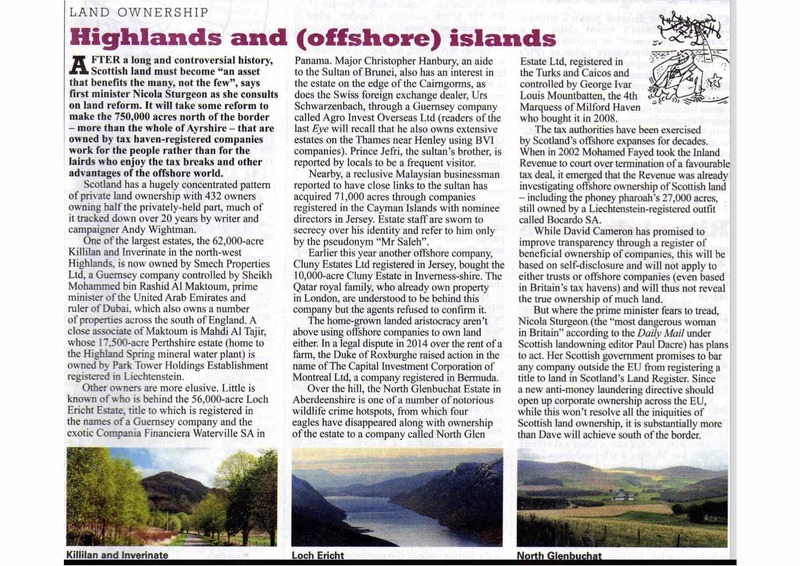 Indeed, it is claimed that 750,000 acres of land in Scotland is owned by tax-haven registered companies. The Land Reform Review Group’s proposal received support following public consultation, with 82% of the respondents agreeing to such a restriction. The proposal, however, did not make it into the new Land Reform (Scotland) Bill. The Scottish Government’s reason for the exclusion is that allowing only EU registered legal bodies to own land would not prevent land being held in trust or the use of complex company structures in order to obscure who is ultimately making decisions about the land. This is a view to which the Government has held fast despite questioning by the Rural Affairs, Climate Change and Environment Committee and the fact that Scottish Land & Estates, a representative body for owners of estates and farms, has no objection to the proposal. Instead, s35 of the Bill was included and provides that “the Scottish Ministers may make provision about the access to information on persons in control of land by persons affected by that land.” The details of the key phrases “persons in control of land” and “persons affected by that land” are yet to be outlined. Section 36 of the Bill goes on to allow the Scottish Ministers to make further regulations giving the Keeper of the Registers of Scotland the power to request information relating to proprietors. Andy Wightman, in giving evidence to the Rural Affairs, Climate Change and Environment Committee on 7 September 2015, raised his concerns about the effectiveness of these sections, arguing that the Land Reform Review Group’s proposal should be reinstated and the existing provisions should be removed as they serve no purpose without an enforcement mechanism in place. The reforms in Scotland reflect a broader agenda of publicity and transparency of property ownership. The recently adopted 4th Money Laundering Directive of the European Union requires a beneficial owner register for business entities to be established within two years in all member states, which shall include information on ultimate beneficial owners. This directive has been foreshadowed in the UK in relation to companies by the introduction of the Register of People with Significant Control, which all UK companies will be required to maintain from next year due to the Small Business, Enterprise and Employment Act 2015. Further, in July this year, David Cameron announced that the UK Government will publish Land Registry data about which foreign companies own land in England and Wales. As can be seen, much of this focus on publicity is motivated by concerns of money laundering or tax evasion. The proposed reforms in Scotland and the broader context in which they are located, raise the question: is all publicity good publicity? It is suggested here that unfettered access to information on land ownership on account of publicity is neither necessary nor desirable. Firstly, it is not necessary because it can be argued that the publicity principle of property law is inherently limited to having a system in place which could grant the information to all but only does so when needed. This means that, for example, where someone is affected by the exercise of the ownership of land, is contemplating offering a loan to an owner, or the authorities are concerned about tax evasion with respect to the land, access to information could be granted. Thus, a comprehensive register with all required information should be established and kept. However, it does not necessarily mean that everyone should have access at their fancy. Secondly, unfettered access to information in the Land Register may be at odds with data protection principles that protect the privacy of those registered in the Land Register. Privacy in this context does not mean the ability to conduct oneself in one’s home without having to fear peeping toms or the like, rather here we are dealing with privacy regarding your personal data. Personal data held by the Land Register ranges from name, date of birth, marital status, address, previous addresses, price of property, whether a purchase of land was financed with or without the grant of a security and so on. Protection of personal data is a fundamental right of the European Union. More specifically the rules regarding the processing (ie almost any handling of the data, including storage and granting others access) of personal data can be found in the 1995 Data Protection Directive, implemented into Scots law by the Data Protection Act 1998. At the core of this legislation are the data processing principles (Sch 1 Data Protection Act 1998) which require that the processing should be done fairly and for a specified purpose, either on the basis of consent or another legitimate basis. The latter is found, for our purposes, in the land registration legislation. While not all principles apply to the processing as carried out by the Keeper of the Land Registers (s34 Data Protection Act 1998 excludes the fourth principle dealing with the accuracy and keeping up to date of personal data) the third principle of data protection does apply. This principle states that “[p]ersonal data shall be adequate, relevant and not excessive in relation to the purpose or purposes for which they are processed”. Herein we can find a proportionality requirement. The application of this principle to land registration begs the question: is virtually unrestricted access, save for a small fee, to personal data of those registered still proportionate to the goal for which the personal data is processed? Or can it be considered excessive and should therefore perhaps be curtailed? Unfettered access to personal data also creates the ideal environment for misuse of that information. One example of where information was accessible to all on the internet and this turned out to have unexpected adverse effects comes from the HM Land Registry in England & Wales. Prior to 5 November 2007, anyone could access, for the price of £2, copies of original documents relating to land bearing signatures of the parties. Some of these signatures were then forged on a form to transfer land from the owner to the fraudster, who would then become the registered proprietor. This, of course, was not only a problem of publicity of the signature but interestingly, one part of the solution was to restrict the online access to the original copies of the documents. This example highlights that the interest in protecting privacy has a new sense of urgency with the utilisation of the internet for the dissemination of information. Whereas the access to the information in the Register of Sasines takes time (as well as skill), the same information can now be gleaned from the Land Register quickly, easily and at low cost through Registers Direct, which allows searching by property or by name, giving an overview of all the property (on the Land Register) owned by a particular person or company. At a time when we are often being reminded of the dangers of putting personal information online ourselves, for example through social media, due to identity fraud, it is perhaps surprising that some of our personal data is made available so easily by a public body with barely any restriction to its access. Is there are solution to this particular problem? A vague hint is given in the Land Reform (Scotland) Bill where information will only be made available by the aforementioned s35 to “those affected by that land”. The policy memorandum attached to the Bill recalls this limitation and states that “[t]he key consideration will be that the interested party must have some justifiable reason for needing this information and that must be related to the land in the question”. Regard could also be had to 4th EU Money Laundering Directive where access to the new register will be available (1) unconditionally to any EU Financial Intelligence Units – these units are tasked specifically with uncovering money laundering; (2) “obliged entities (including conveyancing professionals) which have to carry out their due diligence under the Directive” – these are enumerated in Art 2 of the Directive; and (3) “any person or organization that can demonstrate a legitimate interest” (Art 30(5)(c)). In exceptional circumstances and on a case-by-case basis, access may be refused to the latter two categories where access to the personal information may “expose the beneficial owner to the risk of fraud, kidnapping, blackmail, violence or intimidation” or where the beneficial owner is “a minor or otherwise incapable” (Art 30(9)). Indeed, with respect to land registration, certain legal systems in Europe have applied a justified or legitimate interest rule throughout their systems for example in Germany. Under the German system, access to information in the registers is only provided to those that can show a legitimate interest (ein berechtigtes Interesse) in the requested information (§12 Grundbuchordnung). For a lender this may entail access to information about the number of security rights already granted in relation to the land, so as to determine their ranking, whereas for a potential buyer who is already at an advanced stage in the conveyancing process, access is granted to the information about burdens on the land. The merely curious are kept squarely out. A legitimate interest is presumed for certain professions, such as notaries, but they may incur disciplinary sanctions if they access the information without a legitimate interest. As such, the German system has found a manner in which land registration fulfills the publicity principle in allowing those with a need to access certain information whilst also preserving the privacy of registered owners and those holding limited property rights. What does this analysis mean for land reform in Scotland? It is suggested that in the project of the completion of the Land Register and the drafting of the regulations under ss35 and 36 of the Land Reform (Scotland) Bill (if these sections remain in their current form), consideration should be given to the content of the principle of publicity as well as data protection. Further thought could be had to the nature of the information being processed and who has a justifiable interest in accessing such information about landowners in Scotland – remembering, of course, that “landowner” does not just refer to the owner of a highland estate but also to a terraced house in Dundee. It should be stressed that such consideration would not stand in the way of the Government, or other parties, having access to information for tax or research purposes and, for example, releasing statistical data about land ownership in Scotland. We could still find out who owns Scotland but we could do so in a way that respects the privacy that we all deserve to have.